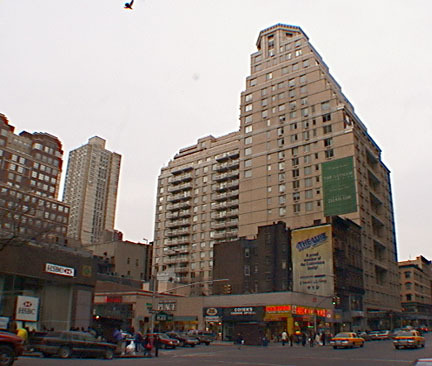 This large apartment tower that replaced a movie theater on the site is one of the few buildings on the Upper East Side to offer some duplex apartments with double-height ceilings, a feature very nicely revealed in the façade by the large recessed balconies on both the avenue and the sidestreet. Developed by William Zeckendorf Jr. and partners and Tony Yamada, this hefty 27-story, 241-unit condominium building was designed by Frank Williams & Associates. 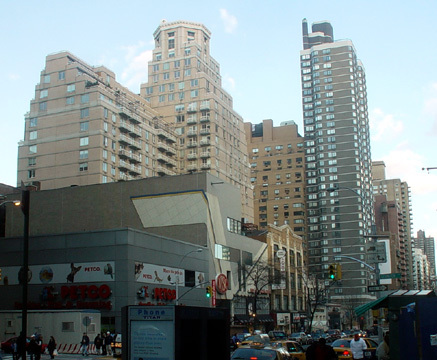 It is notable also for its very attractive watertank enclosure, which is similar in design to one that Frank Williams designed for the Alexandria on Broadway at 72nd Street (see The City Review article). This light-colored brick building opened in 1983 and its avenue frontage includes a movie theater complex. Some of the apartments have fireplaces and all have bidets. The building has a concierge and doorman, a health club and pool, a children's playroom, maid and valet service and a lounge with dining room and kitchen for the residents' use. There is excellent public transportation in this area but also a lot of traffic. The building's entrance, however, is on a quiet sidestreet. 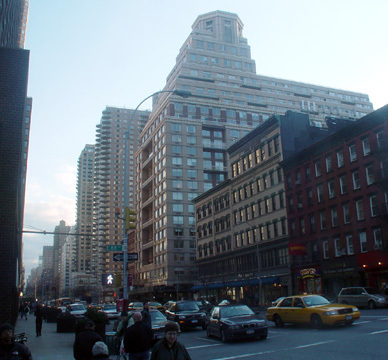 Although 86th Street is a busy retail center for the Upper East Side, this massive but pleasant building has many balconies and is convenient to many private schools in the Carnegie Hill neighborhood.